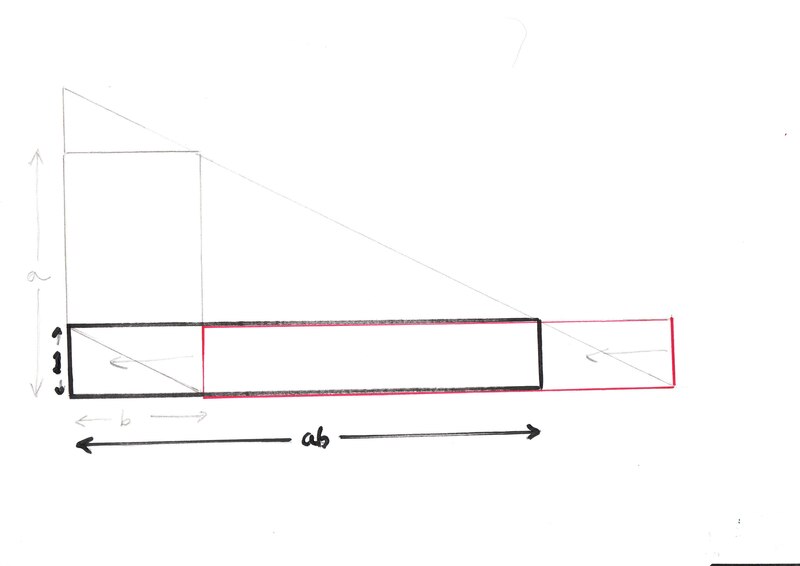 When the altitude a and base b of our rectangle are not rational it is not possible to divide the whole thing into a bunch of smaller rectangles which exactly fit into a rectangle of height 1. So what can we do? 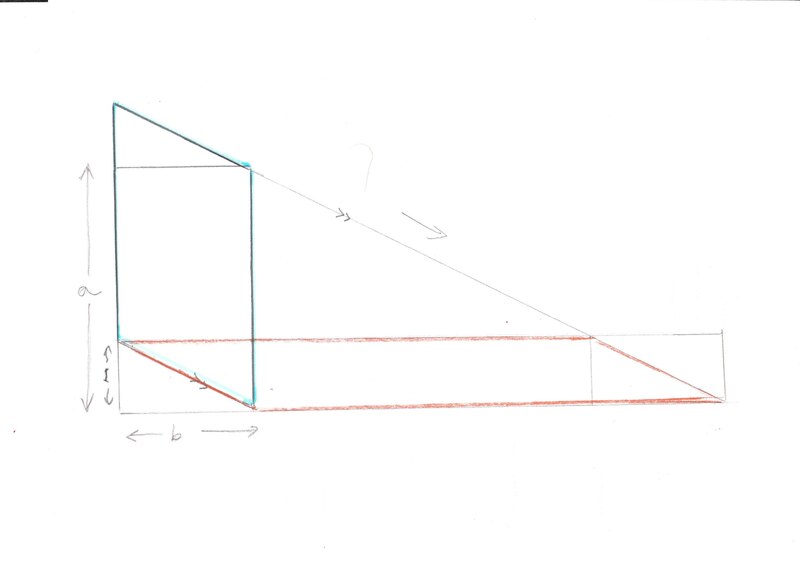 One thing is to look for other ways of finding shapes of equal area, and one that is often useful is called a “shear” transformation. This is what happens to a deck of cards when we slide them across one another to make a parallelogram. 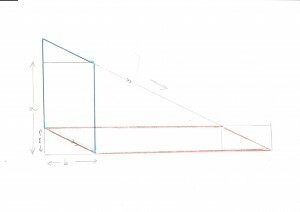 Note that the parallelogram just drawn includes a triangle on the right outside the rectangle which is exactly the same (eg congruent by sAs) to the part of the rectangle that the parallelogram does not cover. 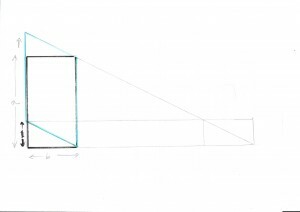 So without actually doing any calculations we can see that the parallelogram has the same area as the rectangle. 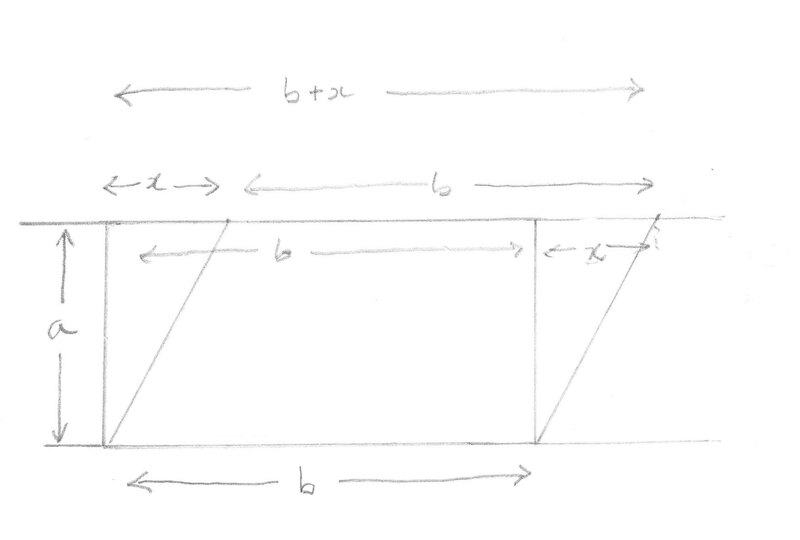 In the above example we used a displacement x which was less than the base length of the rectangle. 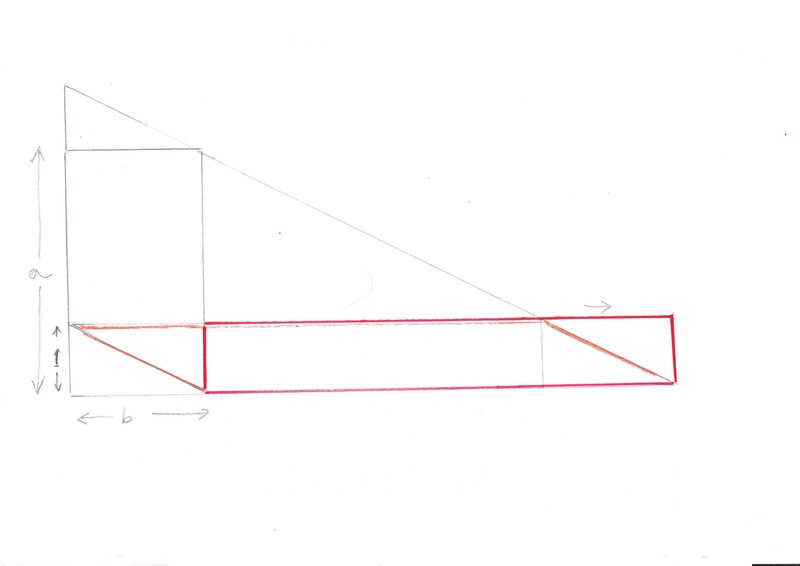 Draw a corresponding picture where the displacement is larger than the base length (you can use a smaller base if you like) and check that the area of the parallelogram is still equal to that of the rectangle. 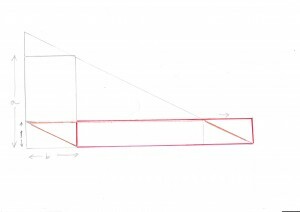 In this case the part of the parallelogram to the right of the rectangle is a triangle with its top left corner missing, and the part of the rectangle not covered by the parallelogram is a triangle of exactly the same shape with its top right corner missing. But the two missing corners are the same little triangle so the extra part of the parallelogram on the right has the same area as the extra part of the rectangle on the left. The key to using this idea for getting the ab area into the unit strip is to notice that if we just wanted to smush it down there we’d have to push both sideways and down. We’ll do that by making a ramp at the bottom. 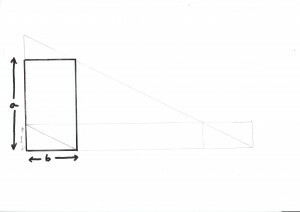 Draw a rectangle with some random base b and altitude a both more than one unit and draw a line from the bottom right corner to the point on the left side at one unit from the bottom, and then draw a parallel line from the top left corner to the extended base on the right. Now consider the triangle at the top right of the rectangle. 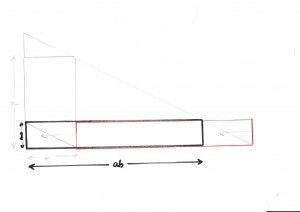 Because parallel lines cut a given line at equal angles we can use the geometric congruence (AsA) to see that the top triangle has the same height (1) as the bottom one so if we “slide” it down the diagonal until it meets the extended base it will actually fit within the unit height strip. 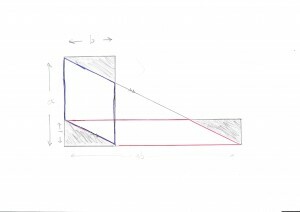 Finally, the two parallelograms between the bottom left triangle and each of the other two (coloured red and blue in the picture above) are related by a shear in the direction of the ramp and so are of equal area. 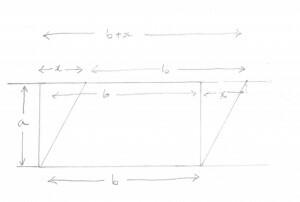 So we have constructed a rectangle of height one whose area exactly matches that of the one with base b and altitude a. 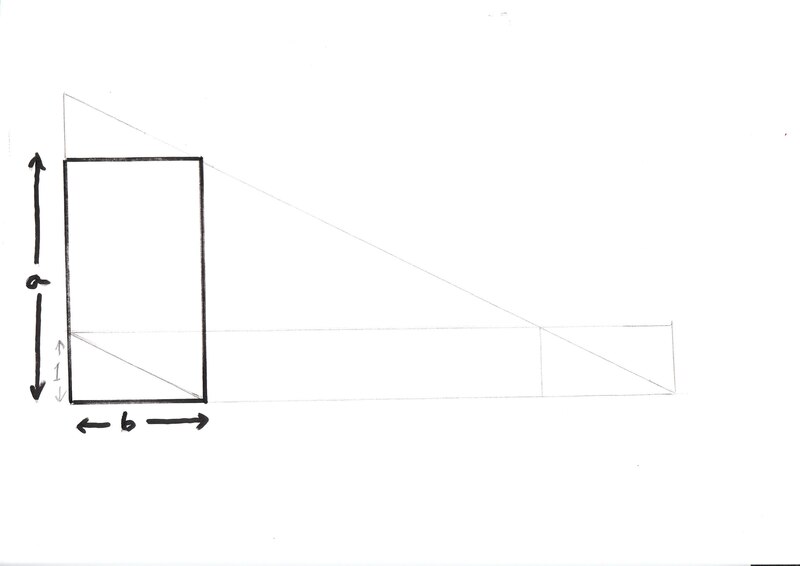 The number of units in the width of this rectangle is the number of square units in its area – and so also in the area of the rectangle of base b and altitude a. Note: We could also do this in a number of shear steps involving the whole shape and without having to bother with the corner triangles. 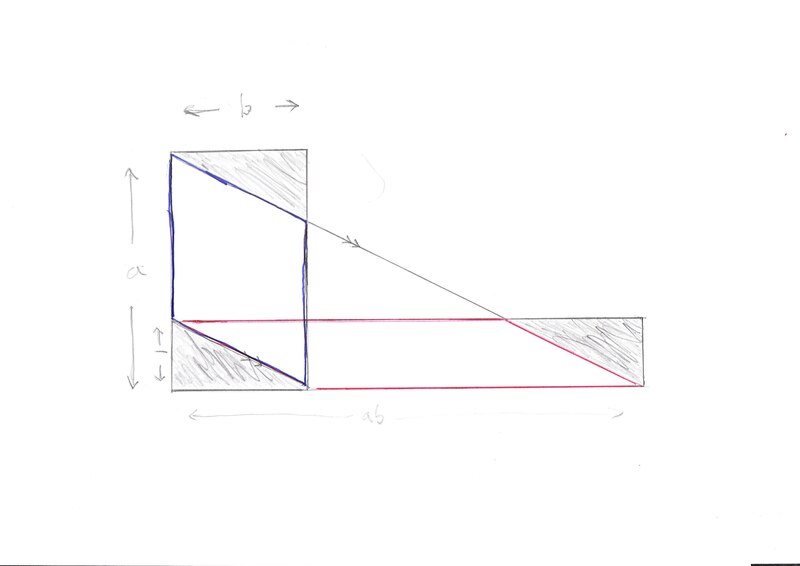 In this case we use a parallel line through the top right corner of the rectangle. 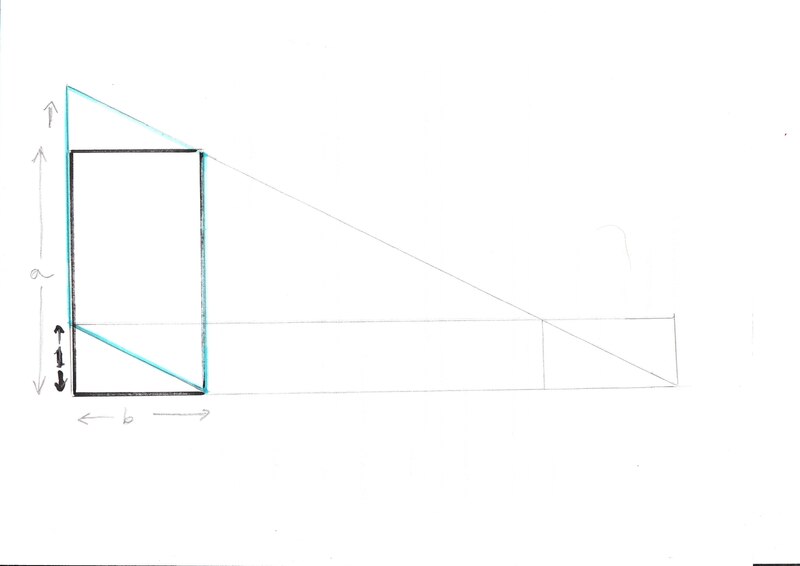 to get a rectangle of unit height and the same area as the original.